15 Are Dead After Landslide In Indonesia Torrential rain caused tons of mud to crash into a village on Indonesia's main island during New Year's Eve celebrations on Monday. Twenty people are still missing. Officials say 15 people are dead after a landslide covered 30 homes in a village on the island of Java. On Tuesday, residents evacuated their homes while rescue workers searched for survivors. Fifteen people have died in a landslide that buried 30 homes on Indonesia's main island, officials said Tuesday. Twenty people are still believed to be missing. Torrential rain caused tons of mud to crash into Sirnaresmi village in West Java on Monday evening just before sunset, while New Year's Eve celebrations were underway, The Associated Press reports. 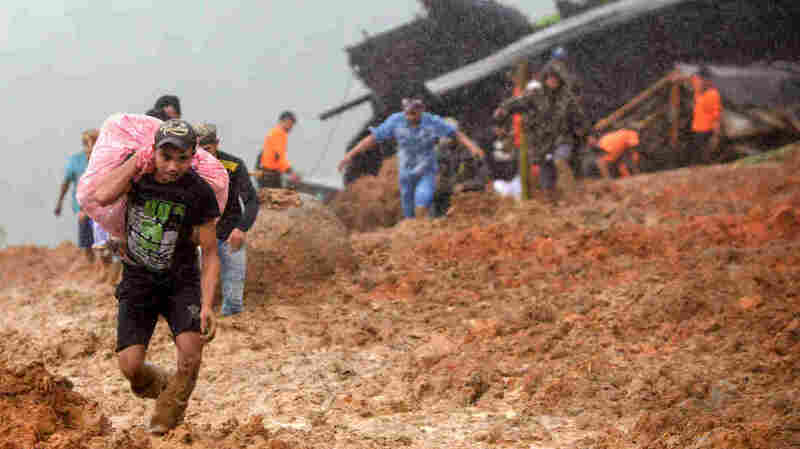 The death toll rose from initial reports as rescuers worked to recover bodies from the mud. Hundreds of residents, police and soldiers searched through debris using hand tools and their bare hands, according to AP. The muddy conditions made it difficult for tractors and other heavy equipment to reach the disaster site to assist in the search effort. But Made Oka Astawa, head of the operations division at the National Search and Rescue Agency, told AP that two excavator vehicles were able to reach the disaster area, and helped recover several bodies that had been buried under 13 feet of mud. Astawa also told AP that search and rescue efforts were put on hold late Tuesday local time because of darkness and heavy rains. The operation will be picked up again early Wednesday. "Lack of equipment, bad weather and a blackout hampered our rescue efforts for those who are still missing and feared dead," National Disaster Mitigation Agency spokesman Sutopo Purwo Nugroho told AP. Nugroho said 60 people who lost their homes in the landslide have been moved to a temporary shelter. The landslide is the most recent of several major disasters that hit Indonesia in 2018. In December, a tsunami triggered by volcanic activity on another of Indonesia's islands, Anak Krakatau, killed over 400 people and wounded nearly 1,500 wounded, NPR reported. Kathy Mueller, a communications delegate with the Red Cross, told NPR's David Greene after last month's tsunami that Indonesia is still feeling the effects of several other disasters since the summer, including earthquakes on the island of Lombok in July and again in August, and a tsunami in September that killed more than 1,700 people. "Every disaster has its own unique context," Mueller told NPR. "No response is ever perfect. So there's always the opportunity to learn and to improve." Search efforts at the landslide site are expected to resume early Wednesday.